Below, you’ll find answers to some of the most common questions we receive here. Due to a high influx of emails, we cannot always promise a quick response to non-urgent messages, so please read through the FAQ before contacting us to ensure we haven’t already answered your question. I'm new - where do I begin? If you’re just getting started on the path to Wicca, witchcraft, and/or magick, you’re in the right place! First of all, you may want to check out the article How to become a Witch, which offers advice for beginners. Further down there is a list which points you towards the most helpful information for beginners. Once you’ve familiarised yourself, you’ll want to check out our article library, our free magic spells, and our magick trouble-shooting guide. 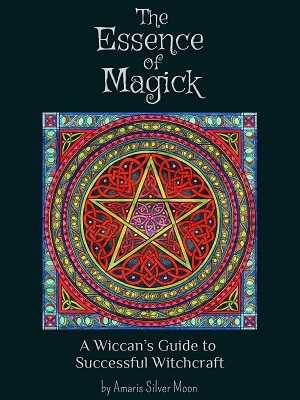 There is also The Essence of Magick, a guide which teaches you how to manipulate energies and tap into the forces behind magick. Our resident witch Amaris Silver Moon was asked countless times to mentor people personally, but didn’t have enough time to do so. As a result, she wrote this book to reach out to all those who need help and guidance on their path. No, we don’t cast spells for people. Even if we had time to do so, spells are most effective when cast for oneself, because of the powerful intent and shifts that happen during and after a spellcasting. It is a very rare Witch who can cast spells as effectively for others as they can for themselves. For this reason, we warn people against spending large sums of money on spellcasting services online. If you want to take control over your life, the magick must come from within you, and this is where we are happy to help! Between our huge article library and our collection of free magic spells, there is enough information to start learning the basics of magick and how to cast your own spells. If you would like a more structured approach to learning magick, we recommend The Essence of Magick, a guide by our very own Amaris Silver Moon. Are there any simple spells I can start with? Becoming skilled at magick requires time, study, and practice. If you are just starting out, we suggest you try a simple candle spell. Look through this candle colour list, and pick the colour most suitable to your desired outcome. Charge the candle with your intent – hold it in your hands, ask it to help you achieve your intended outcome, and send energy to the candle to help it connect with you and your wishes. Light the candle, and visualise your wish already having come true. Sit in this meditation for at least 15 minutes, really immersing yourself in the feeling of having achieved your desire. Thank the candle and blow it out. When you do this, you state and amplify your intent through charging it into the candle, and use the element of fire to help manifest it. Visualisation helps you move closer to the reality of your wish having come true. You can keep the candle after you’re done, but it has now been charged with this specific type of energy and can therefore only be used for similar spells and meditations in the future. You can also buy small spell candles which are of a convenient single-use size. If you'd like more, go here for more easy (and free!) spells. I don't have a spell ingredient - what do I do? This is a question we get a lot! What do you do when you don't have a red candle, or a specific herb or oil or incense? First of all, the power of a spell is in your ability to get into a magickal state of mind and focus your intent, not in the exact ingredients used. So it's absolutely fine to substitute ingredients! If your spell calls for a specific colour candle, and there's no way you can get hold of one, substitute it for a white candle, since white contains all the colours. If a spell calls for a specific herb that you don't have, look at a list of herbal correspondences to figure out what you can substitute it with. The same goes for crystals, oils and incense (just Google search the intent of your spell plus the ingredient, e.g. "money crystals" or "essential oils for love". What is a circle and how do I cast one? A circle is a way of focusing your magickal energy and intent within a defined boundary to make it stronger, as well as protecting you from unwanted influences that may be drawn to your spell. Read more about how to cast one here. Why didn't my spell work the way I wanted it to? This is something that nearly every witch has been through, and it can be very frustrating when spells just don't work - or even worse, when the outcome is the opposite of what was intended! That's why we've put together a magick trouble-shooting guide which will help you pinpoint exactly where the spell went wrong, and provide you with practical solutions to fix it. We receive many questions about using magick for love. This is tricky, for two reasons: you must never interfere with another person’s free will; and everything you send out will come back to you. Therefore, you must never use magick to bind a certain person to love you, nor should you ever cause harm through break-up/revenge spells or otherwise wishing hurt upon another. We have a range of love spells on the website, but they are all constructed in a way that respects the process, as well as the person at whom it may be directed. But as a general rule, love spells work best for healing existing relationships, or attracting non-specific love into your life, increasing your own confidence and inner light, and self-love. The best way to find love is to truly love ourselves. How do I protect myself from evil entities? We first recommend that you read up on some easy protection tips and tricks here. Most of the time, employing a few of these will be enough to solve the problem. If you feel that you would prefer a set spell or ritual, we have a number of free protection spells. When accessing other realms and planes through spellcraft and meditation, you may want to protect yourself since you are somewhat more open and vulnerable to outside entities. You can do this by casting a Circle of Protection. No, we don’t. We don’t even believe in the Devil, since he is a Christian construct. If anything, we may view the concept of the Devil as darkness and negativity, while ‘God’ represents light and positivity – the two opposing forces existing in the duality of the physical plane. Wiccans are not evil, and do not seek to harm others. In fact, Wiccans tend to place high importance on ethics. Black magick is magick with harmful intent. Wiccans never practice black magick – we live by one rule, and that is to Harm None. As long as we are not bringing harm upon another being, we are free to live as we choose and do as we wish. This means you are free to forge your own spiritual path, using whatever means and deities you please. There is no dogma or rule book. But the one rule we all follow is, never cause intentional harm. Black magick is based in darkness and greed, often aimed to harm other people, bring about revenge, or for personal gain at the cost of someone else. Wiccans, however, practice white magick, and if someone has wronged or hurt us, we will use magick only to heal ourselves – never to avenge anyone. Because we know that what we send out comes back to us; and also that the only way to effect true and long-lasting change, is by changing ourselves and our reactions to our surroundings. To learn more, see our guide on white magick. Where can I find other Wiccans and witches to connect with? There are a few ways to connect with other Wiccans in your area. First, go to Wiccan Meetup and enter your location to see if you have any local Wiccan groups. Alternatively, you can search online for the name of your town or area, plus “wiccan group coven” or “wiccan meetup” and see if you get any results. You can also look around for spiritual events, talks, meetups, or festivals that may take place near you. Go there and see if you can meet some witchy friends. If you don’t have any Wiccans near you, a great alternative is Wiccan online forums. There you can join and connect with other witchy individuals and find inspiration and company. See, for example, Pagan forum and Everything Under the Moon.